Some very smart people a long time ago, decided to prevent another World War by working to unify European countries that share and haven’t always *shared well* the European continent. To preclude another internecine war they created several brilliant Euro-centric political institutions such as the European Community, the European Economic Community, the European Union, the Eurozone, the European Court of Justice, and other political, economic, and judicial European institutions — and they enthusiastically embraced internationalism and multilateralism via institutions such as the United Nations and NATO. It wasn’t all about preventing another war, of course. By 1972 it had become as much about improving the pan-European economy as it was about presenting a united bloc to the militarily powerful Soviet Union. Britain’s decision to join the EC/EEC and later the EU was obviously part of that geopolitical master plan — and if you read the texts carefully enough with a little ‘reading between the lines’ — it becomes obvious to all but the most tone-deaf that senior British politicians of the era and their negotiators considered that Britain might not be married to the continent forever. To put it forthrightly, Britain joined the European project to help Germany and other countries ‘gel together’ under a unifying organization to prevent another European war — and it’s possible to find internal texts proving that Britain planned for a possible exit from the EC and the EEC and (implied) from the EU, once the continent became permanently united under one political structure. Therefore, only those too young to remember the history of the EC, the EEC, and the formation of the EU, don’t see that Brexit was always on once the continent had become irrevocably joined. Not only did Great Britain pay more than it’s fair share in WWI and WWII, it also contributed more than asked during the Cold War, and it contributed more to the European project than any country with the notable exception of the United States. Now is the time for Britain to leave the EU and make up for lost time. So said 17+ million British voters on June 23rd, 2016. It is against this backdrop that a majority of Britons still want Brexit, a clean Brexit, and a fair Brexit. And why shouldn’t they? The UK has paid more than it’s fair share towards the continent since 1914 and still contributes more than it receives from the EU. Britain, the cash cow. Yet some in Britain can’t stop haranguing the government for having the audacity to try to deliver what the people voted for — Brexit. Never since Prime Minister Winston Churchill called upon Britons to prevail no matter the hardship has a country needed the strong support of its citizens and all levels of government. Brexit is going to be one of the biggest challenges the UK has seen in decades. And instead of ‘All Hands on Deck’ with every person in the country coming together to strengthen the hand of the Prime Minister and her negotiating teams during what will undoubtedly be difficult negotiations complete with EU officials acting the part of the suddenly jilted lover, we have some British people doing everything in their power to derail Britain’s chances of getting a good deal! I know you lost the referendum, but for God’s sake don’t sabotage your country just because you don’t like the democratic result. Of course, it’s the job of the loyal opposition parties to provide policy alternatives to the sitting government’s plans. Nobody can blame them for performing their noble calling which has roots going back hundreds of years. But it seems that some are so upset they lost the democratic referendum that they actually want the government to fail, they want the Brexit that was approved by 17+ million voters to fail, and they want to demean anyone who supported Brexit. Really, if you prefer the EU to the UK, why don’t you just move there and become a citizen? I’ll help you pack. This is no time for un-democrats to undermine their own country’s democracy, and who believe in the superiority of an un-elected Brussels cabal that lives off the largesse of UK (and German!) taxpayers — both countries pay more per capita towards the EU than any other country. All of whom conspired to convince the Prime Minister to call an election to prove to EU negotiators that Britain is united and moving forward with Brexit, and to quell the small number of UK-based naysayers in the Houses of Parliament and on the street — who get far too much airtime on slow news days. With a fresh mandate from voters on June 8th Prime Minister Theresa May’s negotiating hand should be dramatically strengthened, thereby allowing her to obtain the best Brexit deal for the UK. This Prime Minister has gotten stronger every month since being sworn into office, and calling an election to silence the outliers and to strengthen her hand in the Brexit negotiations that will determine Britain’s destiny for decades, may turn out to be a stroke of genius. Voting to tie one hand behind Theresa May’s back at this point in time only serves to weaken the United Kingdom. Surely no true Briton would consider such a thing. Trident: Should the UK Employ Strategic Deterrence or Strategic Hope? A conversation has begun in the post-Cold War era about whether Britain and other countries should continue their nuclear missile programmes. In the United Kingdom, the Trident missile delivery system is up for discussion along with modernized warheads. In case you haven’t heard, the Trident missile system is favoured by the government to replace the Royal Navy’s Cold War era nuclear-tipped missiles. If nuclear materials deteriorate beyond a certain point and detonate aboard a RN submarine in the middle of the Atlantic, it would be a very sad day indeed. Which is why nuclear weapons aren’t something to play around with — and that includes playing politics. But no matter the name, the doctrine of Mutually Assured Destruction has worked to prevent nuclear confrontation since 1945. Under the MAD terms, no sane leader would use nuclear weapons against another country as it would bring an equally devastating nuclear response from the attacked nation. Although leaders of countries have become furious at each other in years past in regards to trade disputes, SR-71 overflights, or attempts at regime-change — their knowledge that a nuclear strike / counter-strike could occur if the dispute gets out of hand, such incidents are automatically self-governing due to the horrific consequences attached to nuclear weapons use. And it works! Nuclear deterrence has performed flawlessly since 1945 to prevent major conflict between nation-states. Why Would We Need MAD in a post-Cold War World? Those words were barely uttered before World War I arrived. And similar occurred in the interwar period between 1919 and 1939. People thought there could never be another World War as the consequences of the First World War (‘The War to End All Wars’) were still too horrible to contemplate. But World War II did arrive and in many ways it was more horrific than WWI due to the advanced firepower of the era. Then came the Korean War, the Vietnam War, the Soviet/Afghan War, then the 1990 Gulf War in Iraq, and in 2003 the second war in Iraq which we call the Iraq War, along with the 2003 Afghan War. Not to mention the almost countless brushfire wars that have occurred in Africa, Asia, the Middle East and South America and Central America during the postwar era. In every case, the public consensus was that the previous war ‘had to be the last war’ because ‘war is too horrible to do’ and thenceforth only peace would reign on Earth. Every combat-experienced Admiral will tell you; ‘Prepare for War, but Always Plan for Peace’ for they know better than anyone that war is simply an extension of human psychology. Eventually, diplomacy will fail and the military had better be up to the task of defending the country — or they and their fellow citizens won’t have a country. With a strong military a country can decide to take part in a ‘Coalition of the Willing’ for example. But very few countries with a powerful military get invaded. Not that invasion is the only type of warfare, but that’s the primary reason nations divert precious resources to fund a viable military. Certainly, nuclear-armed nations aren’t subject to invasion, nor will any potential conflict go far, as the world’s nuclear powers police not only the world but each other as well. The UN Security Council permanent members are all nuclear powers and each of them has an outsized say in world affairs. It would be naive in the extreme to think that the UK could stay in the UNSC should it decide to give up its advanced nuclear weapons programme. Having a viable nuclear weapons system is one thing, but having a say in global affairs at the highest level is on the shortlist of things that identify the United Kingdom as a Top Ten political power. Sometimes it’s about defending the interests of your country and like-minded countries, even if that means continuing with an expensive Cold War programme that was designed from the outset to make war far too costly to contemplate. And, the most important point of all? It has worked perfectly, every day, since 1945. In the discussion between Strategic Hope vs. Strategic Deterrence, my heart is with those who believe that one day the human race will mature to a point where war is left behind in the dustbin of history (as it should be!) but in the meantime, my mind favours what has actually worked over the past 72 years. Poseidon’s trident must remain. Since 1969, the United Kingdom has had a Continuous At Sea Deterrence (CASD) tasked with protecting the UK in case of nuclear attack. 1 submarine is constantly armed and at sea while another 1 is undergoing maintenance. A further 2 are in port or training. The submarines around which the system is based are obsolete and need replacement. 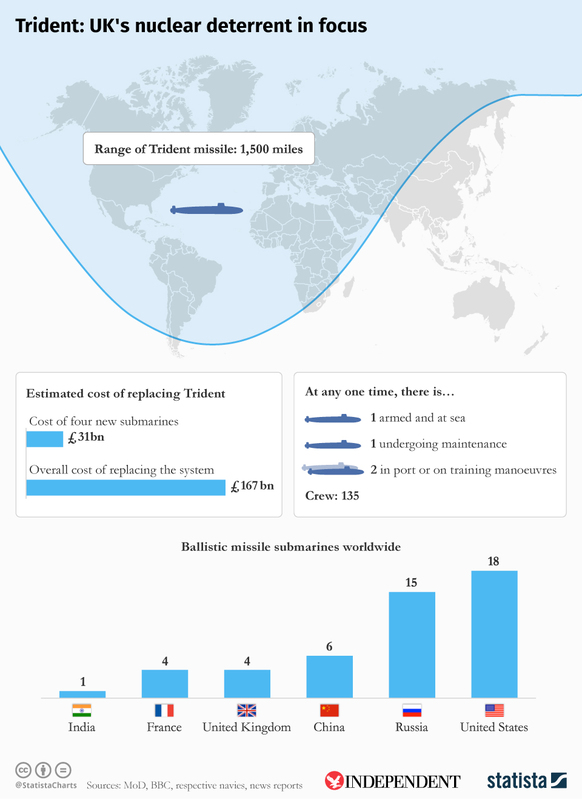 UK submarine and missile system replacement costs could reach an estimated £167 billion. Image courtesy of Statista. In a surprise statement from Number 10 Downing Street, UK Prime Minister Theresa May announced her courageous decision to go to the polls on June 8, 2017 which will ensure stability as Brexit negotiations begin. “I have just chaired a meeting of the Cabinet, where we agreed that the Government should call a general election, to be held on June 8. I want to explain the reasons for that decision, what will happen next and the choice facing the British people when you come to vote in this election. Last summer, after the country voted to leave the European Union, Britain needed certainty, stability and strong leadership, and since I became Prime Minister the Government has delivered precisely that. Despite predictions of immediate financial and economic danger, since the referendum we have seen consumer confidence remain high, record numbers of jobs, and economic growth that has exceeded all expectations. We have also delivered on the mandate that we were handed by the referendum result. Britain is leaving the European Union and there can be no turning back. And as we look to the future, the Government has the right plan for negotiating our new relationship with Europe. We want a deep and special partnership between a strong and successful European Union and a United Kingdom that is free to chart its own way in the world. That means we will regain control of our own money, our own laws and our own borders and we will be free to strike trade deals with old friends and new partners all around the world. This is the right approach, and it is in the national interest. But the other political parties oppose it. At this moment of enormous national significance there should be unity here in Westminster, but instead there is division. The country is coming together, but Westminster is not. In recent weeks Labour has threatened to vote against the deal we reach with the European Union. The Liberal Democrats have said they want to grind the business of government to a standsill. The Scottish National Party say they will vote against the legislation that formally repeals Britain’s membership of the European Union. And unelected members of the House of Lords have vowed to fight us every step of the way. Our opponents believe that because the Government’s majority is so small, our resolve will weaken and that they can force us to change course. They are wrong.